Before Alex Curran tells us how her eyebrows are expressions of her inner Wag, with their own store cards and stylists, OK! must set the scene. The story begins in that place where life is so good they named it twice – Baden-Baden. Alex is by the pool relaxing. And shopping, not by the pool (a girl can only dream of that) but in town. But it was not always so. OK! says it was not all shopping and relaxing by the pool. Oh no. Alex “was busily attending to her new baby and her eldest daughter”. We now move on to the point where OK! asks about those wild nights in the German resort. What sparked them off? “There was nothing to do of a day!” says Alex. Wag by name and wag by nature, Alex is surely having a little joke at our expense. We know about her newborn baby and her little girl, how can she have been bored. The very idea! No pictures of Alex delivering this nugget of information are forthcoming, but it’s not hard to imagine those eyebrows shooting up high on her clean brow. 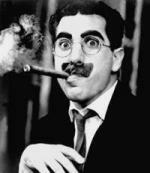 And then wagging up and down in the style of Groucho Marx’s cigar. As for the rest of it… Well, Alex get on with Coleen McLouhglin. And Victoria Beckham and Cheryl Tweedy are friends. “The thing is that when you’re in a big group you do stay with the people you’re closest to,” says Alex. Cheryl has Vicky. Vicky has a holiday to attend so she can’t make it to Cheryl’s wedding. And Alex has her eyebrows.